Blackrow Engineering is committed to providing a safe working environment. At the centre of everything we do is our commitment to providing a safe working environment for our workers and our clients’ workers. We deliver this through safe systems of work, providing adequate and sufficient information, instruction, training and supervision to ensure that health, safety and welfare are an integral part of our management processes rather than being a secondary consideration. We recognise that the development of a culture supportive of health and safety is necessary to achieve adequate control over risks and we therefore employ a dedicated health and safety team who are passionate about safety and have over 20 years’ experience of working within health and safety roles. The team have a wealth of experience in food processing environments, construction, engineering /manufacturing and regularly advise and are involved with major food manufacturing clients on projects that fall under The Construction Design and Management Regulations 2015. Having this in house team to hand, 24/7, ensures safety is integral to all our operations, whether in house or on site based projects. We also provide Principal Contractor and Principal Designer services not only to our projects, but as a third party service. Blackrow Engineering have been members of Safe Contractor since 2004 and currently hold accreditations for pressure systems, fabrication and welding. We are also well versed in construction site management and project management, undertaking project management, Principal Contractor and Principal Designer roles on installation, decommissioning, new-build and demolition projects nationwide. 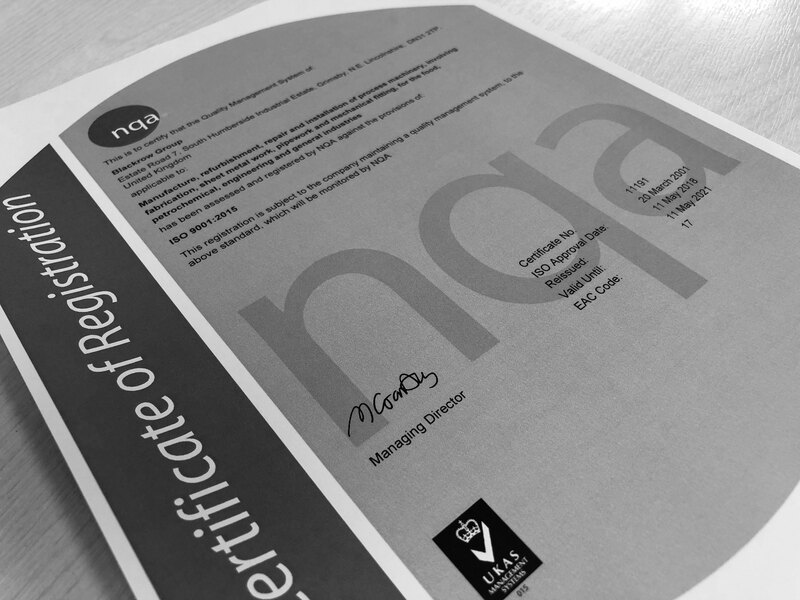 Our quality department endeavour to ensure total customer satisfaction in accordance with the requirements of our ISO 9001: 2015 and BS EN 1090 accreditations.